Home Outdoor Pursuits What is Battle Archery? IntotheBlue investigates this on-target experience! What is Battle Archery? IntotheBlue investigates this on-target experience! So what is Battle Archery all about then? 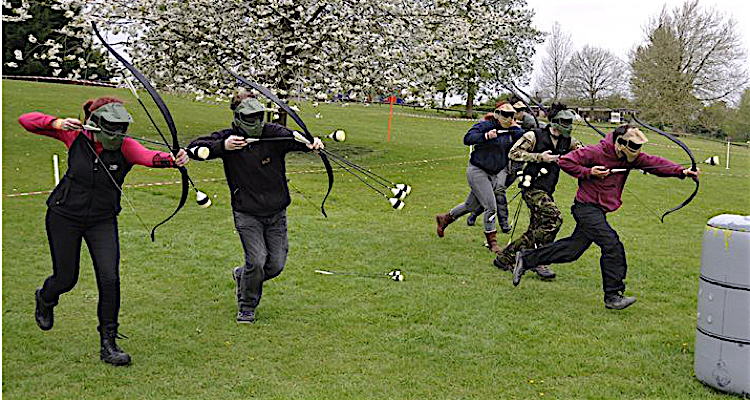 We can tell you that Battle Archery, which is a bit like a cross between paintballing and archery, is brilliant fun. What actually is Battle Archery? Invented in the US of A, Battle Archery is also known as Tag Archery. Either way the idea is the same. 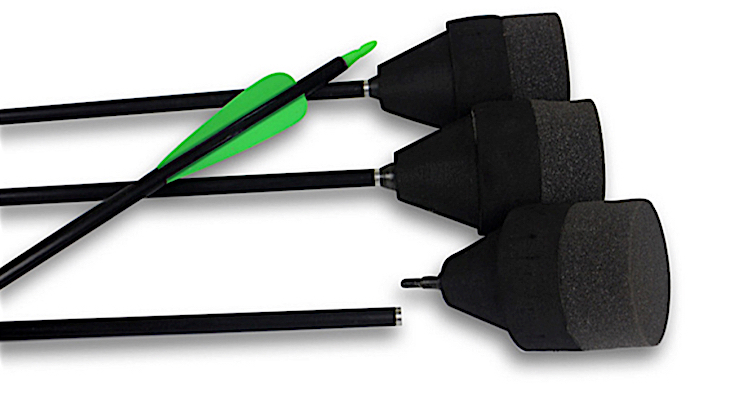 You have a special bow that fires foam-tipped arrows and it’s played as a team game in an outdoor field or arena. What is Battle Archery? It’s a mix of paintball and archery, that’s what! How do you play Battle Archery? We won’t bore you with all the ins and outs of the rules (as each centre may differ anyway), but the essence of what battle archery is all about is easy – you run, dodge arrows and shoot arrows. Some games are based around point scoring, others are an elimination task. Unlike paintball, your ‘ammo’ is unlimited and you don’t actually carry a stock of arrows with you. Game marshals put stashes of the foam-tipped arrows around the playing arena and, of course, there’s nothing to stop you picking up a fallen arrow and re-using it. In fact, it’s actively encouraged! 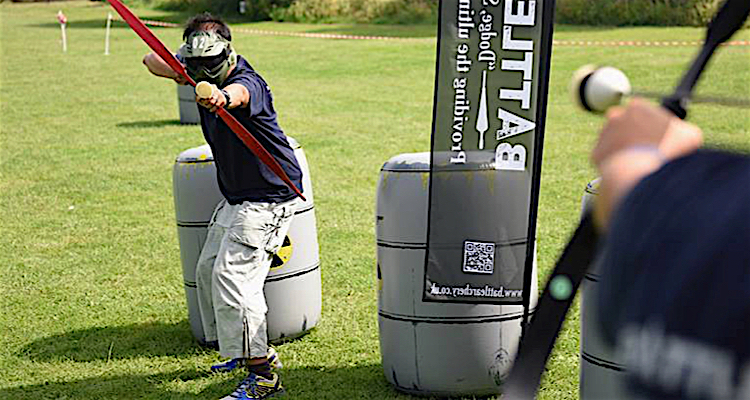 Some venues, such as this Battle Archery operator in Bristol, also offer a version called Aerial Archery, where you take aim at moving targets flying throw the air. 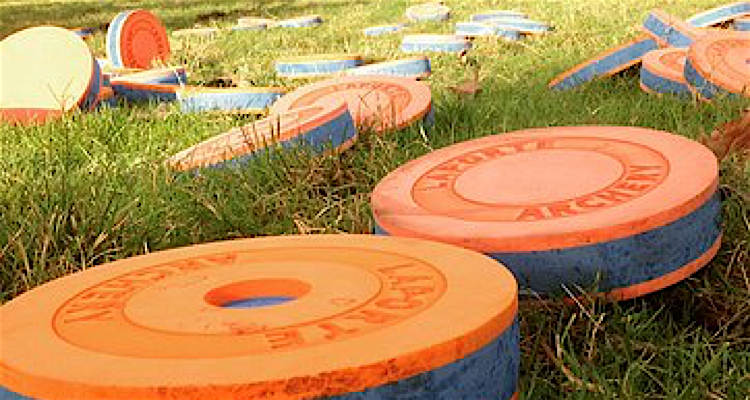 The targets look a lot like clay pigeons, but they are made of foam. And similar to clay pigeon shooting, the targets can come at your from all different angles, trajectories and speeds. 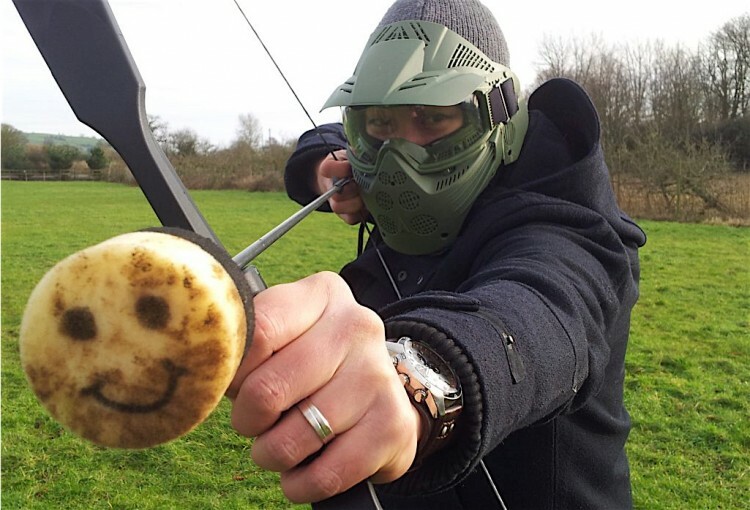 Now here’s what sets Battle Archery apart from paintballing. There’s no stinging sensation after you’ve splatted and no bruises either. One Battle Archer game-player described it as ‘like being hit with a sponge’, which we think is quite a nice way of putting it. Safety remains paramount through and all players will be kitted out with a full face mask and goggles, which are very much in the paintballing style. What other kit do you need to be a Battle Archer? As well as your face mask and goggles, you’ll be issued with an arm guard and a specific Battle Archery bow. These come in different sizes and are ambidextrous, that’s to say can be used by left or right handed shooters. Do you need to be an archer to be able to take part in Battle Archery? No! The instructors at Bristol’s Battle Archery centre always make sure players have a practice in the training area before going out into battlefield. This is to make sure everyone knows how to load and fire their foamy arrows. Where it gets tricky is when you try to run, load a bow and fire it, whilst dodging getting hit by the very opponent you’re aiming at! It is pretty physical, as you’ll be sprinting and crouching down quite a lot and it’s also surprisingly tactical too. Any tips on what the best battle tactics? Watch out for snipers hiding behind barrels, keep your eyes peeled at all times and maybe work together to orchestrate a charge towards enemy lines? Oh and watch out for the game battle marshals, sometimes they can strike with their arrows too! One of the Battle Archery tactics could be a co-ordinated charge! Where can you play Battle Archery in the UK? The game is already really popular in Canada and the USA and it’s just coming to our shores. 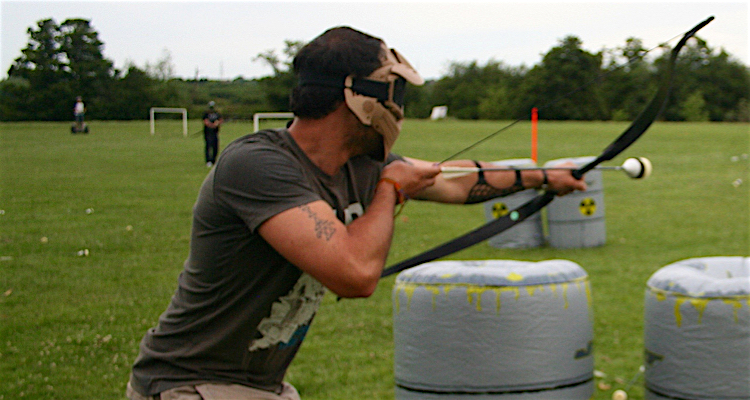 Keep an eye on our archery experiences page for the latest Battle/Tag Archery venues in the UK. Now you know what Battle Archery is, it’s time for you to sign up and take the plunge into the foam-filled combat zone to see if you’ve got what it takes to be an ace Battle Archer! 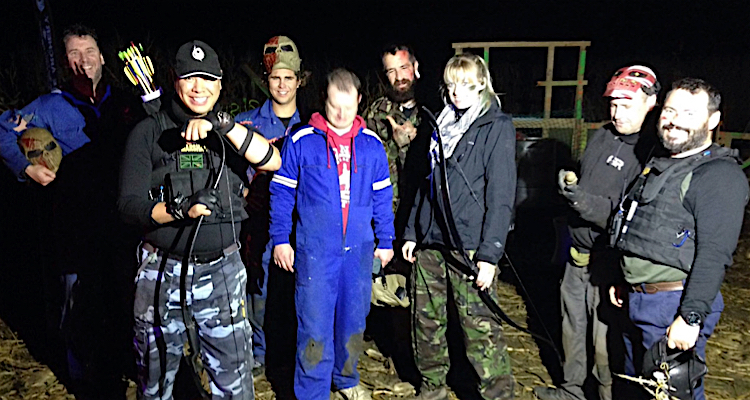 You can even try a night time Battle Archery challenge!